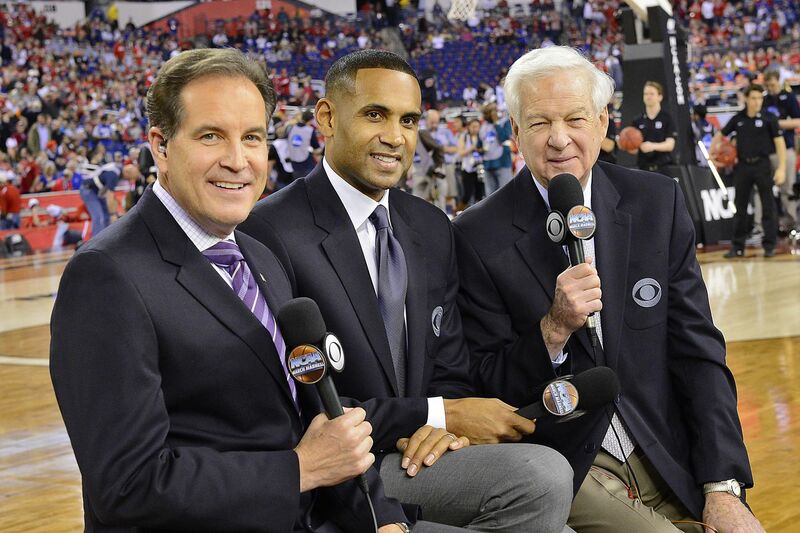 CBS and Turner Sports' lead NCAA Tournament broadcast crew: Jim Nantz (left), Grant Hill and Bill Raftery. Here’s the complete 2019 NCAA men’s basketball tournament TV schedule. CBS broadcasts 24 games, TBS broadcasts 18, truTV broadcasts 13, and TNT broadcasts 12. For full details on how to watch online by streaming on computers, tablets and mobile devices, click here. All times listed below are Eastern. A reminder that times for the second games in sessions will change based on when the games before them finish. Pregame coverage on CBS begins at 8:30 p.m., and postgame coverage concludes at 12:30 a.m. The entire evening is on truTV. Pregame coverage starts at 6 p.m. and postgame coverage concludes at 12:30 a.m.
Pregame shows start at noon on CBS and truTV, 1 p.m. on TNT and 1:30 p.m. on TBS. truTV has the late night wrap-up show, with coverage concluding at 1:30 a.m.
Pregame shows start at noon on CBS, 5 p.m. on TNT and 7 p.m. on TBS. TBS has the late night wrap-up show, with coverage concluding at 1 a.m.
Pregame shows start at noon on CBS, 5 p.m. on TNT, 7 p.m. on TBS and 7:30 p.m. on truTV. TBS has the late night wrap-up show, with coverage concluding at 1:00 a.m.
Pregame shows start at 6 p.m. on TBS and 7 p.m. on CBS. TBS has the late night wrap-up show, with coverage concluding at 1:30 a.m.
TBS has the entire broadcast window. Pregame coverage starts at 5 p.m., and the late-night wrap-up show concludes at midnight. CBS has the entire broadcast window. Studio coverage begins at 1 p.m. There is no postgame show. The Final Four and national championship game return to CBS this year. Pregame coverage begins at 3 p.m., and the late night wrap-up show concludes at 11 p.m.